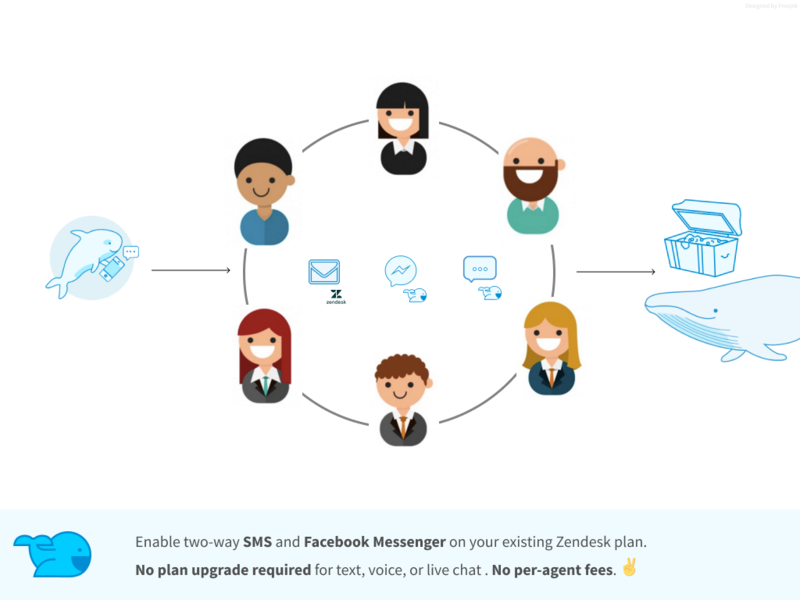 We’ve made it simple for your agents to reply to SMS/MMS and Facebook Messenger messages directly inside Zendesk Support. Managing customer conversations in multiple areas is complicated. 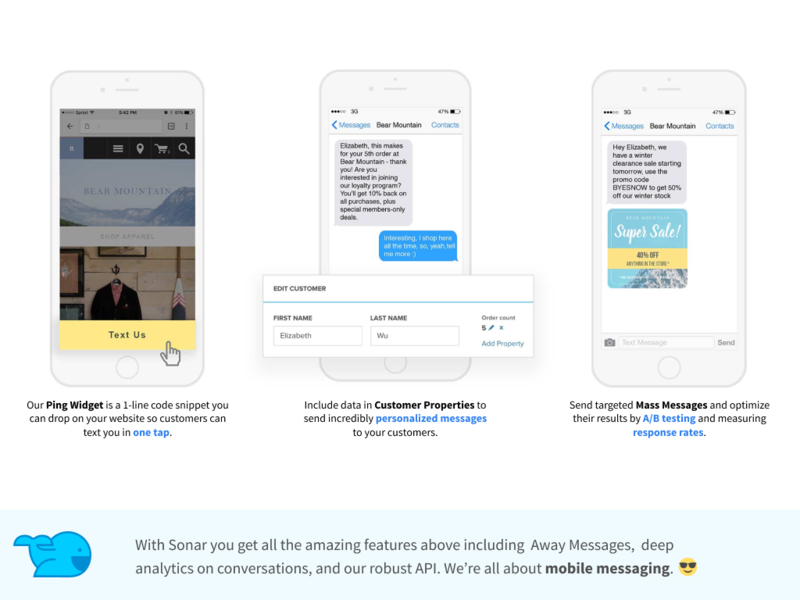 With Sonar, you’ll be able to manage your mobile messaging channels (SMS/MMS, Facebook Messenger) the same way as you already do with email within Zendesk. 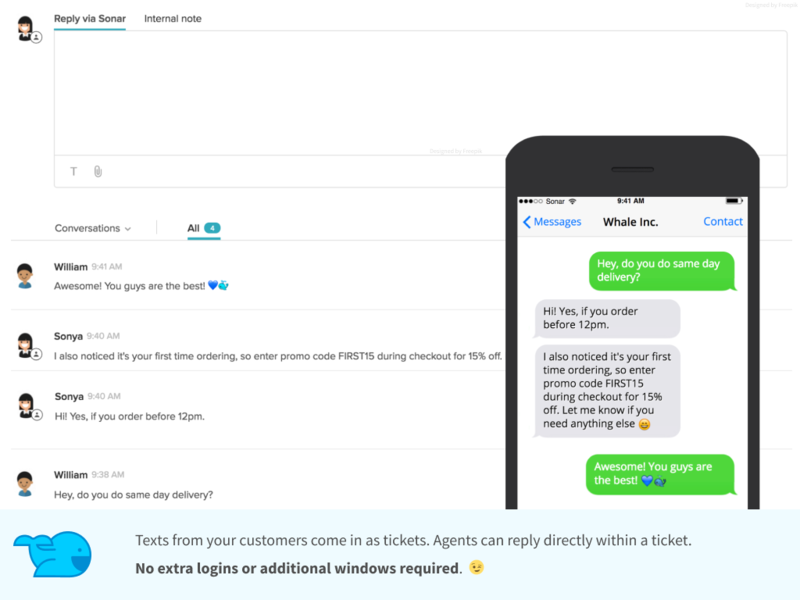 All messages from your customers come in as tickets, and agents can simply reply or leverage any of the tools that exist within your Zendesk account such as macros and triggers. Agents will have no change in their workflow, which ensures that none of your customers slip through the cracks. Bonus: You can reply directly to Slack and email notifications to quickly send a text back when you’re away from your computer. Sonar isn't only for customer service - it is also a powerful tool for promotion and relationship building. Reach out to us for flexible pricing and full scale pilots. We are readily available to ensure you’re meeting your business goals. Our mobile messaging experts will integrate Sonar & Zendesk in a way that works with your ideal workflow. We do this (free of charge) because want to ensure the best possible experience for your team as well as your customers. You can use your existing number with Sonar. We can also provide you a new number that can be used for texting and accepting calls. We will buy and manage all of your phone numbers - you just need to choose an area code and we’ll do the rest! See here for a full list of our integrations. We also have an extensive API that allow for custom integrations with your system.